Is Vivatic a Scam or Legit? Need to Know Before Joining! Vivatic is one of the many paid survey sites, and it promises you can earn real money in your spare time. 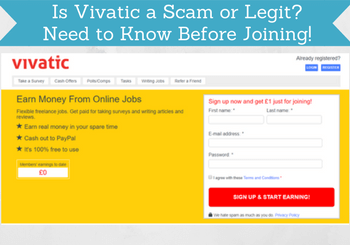 But is Vivatic a scam or is it a legit opportunity to make money online? I have tested the site thoroughly myself, and in this Vivatic review, you will get all the details about what the site has to offers, how much money is it possible to make, and if it is even worth joining – all the things you need to know before deciding whether it is a site you want to spend your time on or not. What is Vivatic, and what opportunities does the site offer? I like to do a little background check on the survey sites I use to see what comes up – it has however been difficult to find any real information about Vivatic. On the website itself, it just says that they are “a bunch of enterprising people that see the real value in leveraging outsourced labour and contractors to help build your business“. It does not say when it was founded, who this bunch of people are etc. A little bit strange, but that does not mean the site is not legit – let´s go into what earning opportunities the site offers to find out more. 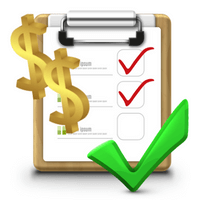 On Vivatic you can take paid surveys. It has a decent amount of these. But how often you qualify depends a lot on your profile, where you live etc. If you do not live in the US and UK, there will be no available surveys. Vivatic is however one of the sites that offer more than just paid surveys. Vivatic mentions on the website that certain times are better for surveys than others. You will find most surveys on Wednesday and Friday evenings as well as all day Saturday. In general, you will not receive emails every time there is an available survey or offer, so it is better to check the site regularly yourself. Vivatic also offers what is called Cash offers and that can for example also be surveys, but can also be to download an app, watching videos and more. It can also be to join a site, which means that you can get a small bonus, if you sign up for certain websites – be aware which websites you sign up for though, as it might open you up to spam (read the terms and conditions before taking any offers). New offers like this come and go all the time – Vivatic is however not a site where I have found the best offers. And again, if you are not from the US or UK, you will not find any at all, and even if you are from the UK or US, it will not be the best offers you find here. Polls and competitions are where you can get a small reward for answering 10 short polls and by doing so, you will also enter into draw for hourly, weekly and monthly prizes. The rewards for this are very low, so it is more something you should do for fun and because it takes vey little time, and not to make real money. The tasks are small online jobs through CrowdFlower. You can see before you start how much it will make you, but it is usually not very much, but also often only takes a few minutes. Examples of tasks can be to check a website for certain mistakes, report inappropriate content etc. Once you have done 20 of these tasks, you will get access to the writing jobs. I tried to get to a point where I would get access to the writing jobs, but I have given up on this as there is not very many small task available in the area where I live. So can unfortunately not say anything more about how these writing jobs are and how well they pay. As you can see from the above, Vivatic has quite a lot of different ways to earn. That does not mean that I am impressed with the earning opportunities though – I will go more into details about this a bit later. Vivatic pays out through PayPal. Be aware that you have to have a verified PayPal account before you can get a payout. You can read more about how to do this on PayPals website, but it is easy and free to do. You can request a payout once you have earned £20/$20. How quickly you will be able to get to this amount depends how many of the opportunities you use. Surveys are usually what pays the best, but when you login, Vivatic has also made a suggestion to how you can get to your first payout (see picture). 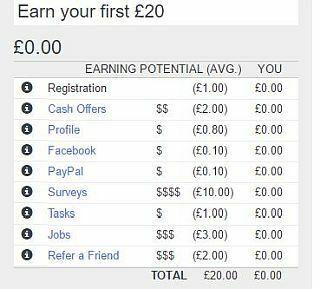 As you can see, you will also get £1 reward just for joining, and you will also get a small reward for connecting your account with facebook, confirming your PayPal account, and filling out your profile. Once you have done one of the things on the list, there will be a green tick, so you can see how close you are to the payout. Be aware that you do not have to do all the things on the list to get a payout. It is just a way to show you how you can get there and try to motivate you, but if you for example only wish to make money on surveys that is also an option. In general, you should however expect that it will take you a while to reach the payout threshold, even if you follow the earning suggestions on the image. Once you have requested payment, you will get the money on the last working day of the following month. So if you request in January, you will get the money in the end of February. That is a very long wait compared to other sites that pay through PayPal where you will usually get the money within a few days or in some case within a few hours. How much time do you have to spend to make money on Vivatic? 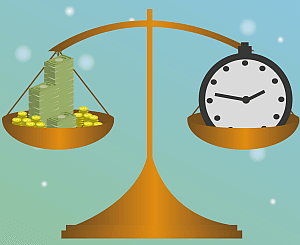 As with any other survey site (or any other online job for that matter), how much time you have to spend, depends how much money you want to make. Vivatic is however not one of the survey sites where you get most value for your time. The surveys pay ok in relation to the time spend, but most of the surveys are from other companies, and Vivativ is kind of middle man. So many of the surveys, you would also be able to take directly on the provider’s website or through other survey sites, and often they paid better. You can make some extra money, if you invite other people to join the site. This can be more difficult than it sounds though, as the person you invite has to make £10 before you get a reward from Vivatic (£2). But if you know people that are interested in signing up and doing the surveys, tasks or anything else there, it can be a nice way to boost your earnings a bit. The tasks pay very litlle, but if you have the time, it might be worth trying to do enough to get some of the writing jobs. These jobs can be transcribing videos, doing reviews, write blog posts, proof reading and more. As mentioned above, I have not managed to do the number of small tasks I need to qualify for the writing jobs, so I cannot say whether it is worth aiming for the writing jobs. But they do sound very interesting and I am curious about knowing more about them, so if you have experience with these writing jobs on Vivatic, I would love to hear from you in a comment below. As in all my other reviews of survey sites, I want to make you aware that Vivatic will not make you rich and will not make you a full time income. If this is what you are looking for, you should look for other options to make money online. It is important to know that if you do not have any activity on Vivatic for 2 months, you account will be cleared. That is a short period of inacticity they allow compared to most other survey sites. So be aware of this, so you do not go away on a long holiday and when you come back, you account will be back to zero. So if you plan not to use Vivatic for a while, make sure to cash out before that. In which countries is Vivatic available, and who can participate? You can sign up to Vivatic no matter where you live. Most offers are however only available to you, if you live in the UK or the US, with the exception of task and jobs that are available for everyone. You can sign up, if you are at least 16 years old. Final thoughts – ok, but you can do better! Your account will cleared, if you do not have activity for 2 months. Slow payment (takes over 1 month). Only available in the US and UK. Overall, I can say that Vivatic will be able to make you a bit of extra money. But as mentioned, many of the offers or surveys that are available are also available on other sites, and many of these are in my opinion better survey sites – they have higher rewards, more opportunities, and are in general a lot easier to use. If you live in the UK or the US, Vivatic can be a way to make a bit extra, but even if you live here, I would recommend to join other sites instead. If you live in any other country, it will be very difficult to make enough money to get a payout, as all you can do then is the very low paying tasks and refer friends. If you have any questions, comments or have any experiences with Vivatic yourself you want to share, I would love to hear from you in a comment below. Vivatic has some opportunities if you live in the UK or the US. But not a lot compared to other sites. Further, it will clear your account very quickly, if you are not constantly active, it has very slow payments, and the other options than surveys pay very little. In general there are many better survey sites to join. Vivatic is definitely not a site for you, if you live in Pakistan. Some great survey sites there are ClixSense, Superpay.me, Toluna, YouGov, and Triaba. Avoid! Was using them since February then I logged in today and my account has been deactivated. £20 pending plus a few quid more is now lost. No replies to emails and all social networks look dead for a good few years. I definitely agree that there are better sites and survey sites with a lot more opportunities. But very sad to hear that they also deactivate accounts like this – I have once tried to have my account zeroed there, because I did not use it for a couple of months, but that they would also deactivate it like this, when you are still using it regularly and take your money is not ok. Thanks for sharing it with the rest of us, so it is possible for people to take your experiences into consideration as well, before deciding whether to join or not. Still no reply from them and after looking on a well known UK review site, reviews are now starting to come in of their accounts also being de activated without warning and no replies to emails. Sorry to hear that Jack , but thanks for the update. It does not sound like a good sign, and definitely sounds like it is not a site worth using anymore. And worst, they don’t reply to my support messages! I do not know if they are still paying. I have given up on trying to reach the payout threshold on Vivatic. It looks like the platform is still active, as they still have new surveys and tasks posted there. There are other sites that also do not really actively use the blog and social media accounts they have so that alone does not necessarily mean that it is not active anymore. But if Vivatic’s support is not answering, it is of course not a good sign. I would try to wait a few days and then write them again and do that a few times. Let’s hope they will then answer. Feel free to keep me updated about how it goes and if they finally will answer. Will be great to know. Gentleman, I live in India – is it preferable for me to use it? No Vivatic is not worth joining, if you live in India. I have made a list of some good sites in India. You can check out the list here. Hope that helps and let me know, if you have any other questions. Vivatic sounds like a decent option. I am not totally sold on it though. I have not yet tried making money at surveys, but it seems like something to look into for a little extra cash. You’ve got me curious as to what else is out there, so I will be reading your top 10 picks to get a better idea. Thanks for this great informative article! Glad to hear you found the information useful. Yes Vivatic can be a decent option, but as you can probably also hear in my review, I am also not totally sold on it. You should especially consider other options, if you do not live in the UK and the US – if you do not, it will be difficult to make very much on Vivatic, and then there are many other sites that are better. Vivatic sounds like it is for people with a lot of time on their hands. I have looked at several survey sites before and have never really spent any time with them. Your review on Vivatic lets me know that your other recommendation, Clixsense is a better choice if this is the direction I would choose to go. How much time do you spend a week on surveys to make a couple hundred extra dollars a month, is it worth my time. Yes there are several better choices than Vivatic in my opinion. Especially if you do not live in the UK or US. How much time you would need a week to make a copule of hundred dollars a month is very difficult to say. Many things come into play – especially where in the world you live, and which survey sites you sign up for. But if you find the good ones in your countries, it can be worth it. With about an hour a day on weekdays, you can do pretty well, when you do on the right sites. You can have a look around my page and see some of the other reviews and my top 10, and hopefully that will help you to find the right ones for you. Also remember that it is free to sign up (if it is not, you should find another site), so you do not loose anything, if a site does not deliver as you hoped and you want to stop using it. But one thing is sure, if you want to make a couple of hundred a month – and that is you will need to sign up for several survey sites. It is very unlikely that you will be able to make that amount on just one survey site – even though some sites promises this. So if you decide to try it out, it can be a good idea to sign up for several.